Gym-mates of tragic boxer Scott Westgarth are trying to move on from the grieving process - and do what he would have wanted them to do. 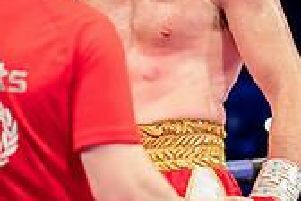 Trainer Glyn Rhodes said Sheffield Boxing Centre went through a “terrible time” after the 31-year-old Penistone light heavyweight died, hours after beating opponent Dec Spelman at Doncaster Dome on February 24. “But now we are trying to do what Scott would have wanted us to do - help his partner, Natalie and do our best to support the family” he said. “We want to do positive things - like organising sponsorships for the Sheffield half-marathon and hosting a Family Fun day at Hillsborough Arena on June 3. Rhodes keeps in touch with Scott’s father John, who himself was a boxer (1982-92) and a contender for the European heavyweight title. “All the family are going through an awful time as you can imagine” said Rhodes. “John was there on the night and ofcourse he is struggling. “Personally, I have thought about the fight a lot and the run-up to it and I know he didn’t do anything wrong. He didn’t take any massive cracks to the head. The other kid got a couple of punches through in the ninth round but they weren’t half what Scott hit him with. “Scott lived right, trained right - he was a fitness instructor and a fitness fanatic too - and won the fight. Rhodes said there was uncertainty about when the coroner was going to release Scott’s body and said no funeral arrangements had been made. * Money raised at this week’s Anthony Joshua v Joseph Parker weigh-in at the Motorpoint Arena in Cardiff will go to Westgarth’s family.